Everyone has a story to tell: My philosophy: Walk lightly, leave no footprints. When my time has come to leave this life, I shall leave only words, no footprints. My 30-year endeavor of my self-published volume is for those that find true pleasure and comfort in nature and it’s beauty. For those that treasure each breathe of life, this is my story. I am humbled by this accomplishment, a 340 page volume, with over 250 images, also including a 50 minute DVD slide presentation entitled “From the Eyes of a Kayak”. Throughout the years I have continually added up to date material. I wanted to write my book so that as time goes by, my writings will never be out of date. My self-published volume is dedicated to the late actor Mr. George Peppard for without his assistance this way life would not have been possible. 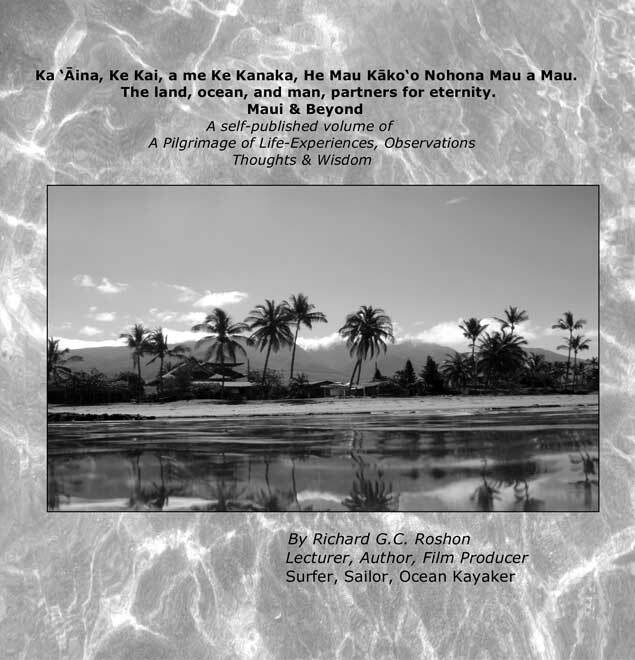 Acknowledgements by Dr. Wayne Dyer, Jean Michel Cousteau, Mr. Nane Aluli and others. "I practice yoga with Richard. I love this man and I believe very strongly in his message". "Richard's life is one many can only dream of". "Richard, I so greatly appreciate your sensitivity and deep feelings about your work and your love of this beautiful place we call home…Maui and her warm sand spirit rejuvenating, surrounding waters. You have such a "feel" for the essence of our home, in so many ways "feelings" than not even I can grasp. This is what makes you…So SPECIAL to this place…Maui…keep on doing what you're doing in sharing your experiences and wisdom. Only good will come out of your efforts because they are shared from a very special and deep place within you. Your spirit is special and your knowledge awe-inspiring". "Thank you so much for putting all this amazing footage, experience, wisdom, and reflection together to share with all of us. And thank you for the lovely inscription! Wish I were there right now, but this “trip” was a close second." "We have just received your book and DVD. We just got through watching the DVD, it was fantastic, very relaxing and the music is great. After reading your book, all we can say is and awe inspiring work of art. " "You are a remarkable human with great passion for the islands, the oceans that surround them & the creatures that grace them. You inspired some new thoughts for us on conservation and being sure to do our part to create awareness by speaking out. YOU DO THAT and that is essential for people to hear. You make a difference and that ripples so very far. You are needed everywhere.. there many souls visit from everywhere and will pass it on or bring you where you are needed to pass it on. The islands need you there. You are one of their voices." "I just finished your book and I must say that I found it very entertaining. But more important, each time I picked it up and started reading I had that deep intuitive feeling that lets me know when I am in the presence of truth. Thank you for adding your unique voice to the chorus of wisdom teachers." "Richard, we recently received your book and our copy of the Lahaina News and I was very pleased to see you on the front page. After reading your book and the article, it made me proud to know that others will now be aware of your book, and of the special man who wrote it. I think of you as Maui's Ambassador because you are "one with this island". You know it better than anyone, and your knowledge and spirit need to be shared with others. The article characterized you beautifully. You should be pleased. " " I finished your book a while back and enjoyed "going back" to a time that was so special to me. Your passion for the environment is contagious and hopefully there will be readers that are impacted appropriately. I learned a lot about other people and dreadful situations our planet faces. "You are making a difference with your book, and your life's work. It shows in your passion." "I just watched your DVD included with your self-published book, with so many incredible pictures, all beautiful, simple and splendid. The book is a joy to read, it's a little like having you tell me a story, it reads like a journal or conversation. Although a conversation would be preferable so I could ask questions, that might drive you crazy. For that very reason, I am a little sad to finish the book. "If I had the money ~ I would buy a hundred books just to pass them around. Considered myself pretty conservative and conscientious before but the book has been an education along with the pleasure of meeting you. "The knowledge you so openly share, stories, you tell because of the life you lead. Very admirable. Without a doubt you are an incredible person, with great strength & integrity way beyond fascinating. "The discipline you exercise everyday and the honor given to the Self as part of the Universe is inspirational. "Wishing you a life of happiness, love & laughter ~ 2013 will be the year of shared education by your hands & life's work. "Good health to you my friend ~Aloha"
If they could talk with us…What could they teach us? What do you know about North Pacific Humpback Whales? I ask that if you are interested in my self-published book to please contact me through my email address. richard.roshon@gmail.com - I’ll then forward my mailing address to you. I have always represented myself, and my life’s work in a very personal manner and will personally sign each book. 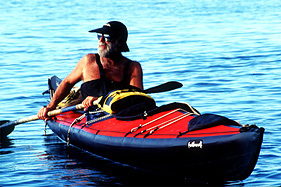 As a freelance artist at 66 years old, I’ve sailed upon the world’s oceans, surfed some of the most beautiful waves the world has to offer and have logged over 30,000 miles of kayaking throughout the Hawaiian Archipelago. My time spent with the sea and nature, primarily with North Pacific Humpback whales has taught me things about this life that cannot be found in a classroom. My book shares so many heartfelt experiences, and much more. Available March 2012, Cost of Book is $35.00 plus $1.45 tax. Shipping any where is the U.S. is $5.25, Shipping to Canada is $12.95, other countries is $16.95.